SINGAPORE (Nov 30): Singapore is getting ready for polls. Because a single party has ruled uninterrupted since 1959, the real importance of the next election lies in the rare leadership transition that will take place afterwards. Finance Minister Heng Swee Keat’s well-choreographed elevation as the city-state’s fourth prime minister is expected to signal policy continuity, though immigration is one area where the status quo is starting to look like stagnation. Any change Heng introduces here will be controversial, but it will have a strong bearing on Singapore’s most coveted asset class: property. Fourteen years ago, Singapore’s third and current Prime Minister Lee Hsien Loong inherited an economy recovering strongly after the SARS epidemic of 2003. The property market, though, was still in despair amid widespread doubts about Singapore’s long-term competitiveness. Lee’s remaking of the port city triggered a near-doubling of prices in the first seven years of his rule, despite a nasty plunge following the 2008 global financial crisis. While the Marina Bay Sands casino and resort is most emblematic of Singapore’s urban transformation, it was the city’s push into wealth and asset management, and its embrace of banking and technology back offices, that created jobs and brought in migrants. And headaches, too. After Singapore’s voters showed their displeasure with overcrowding in the 2011 election, the policy pendulum swung the opposite way. But in aging Singapore, stricter immigration meant accepting slower population growth. Lee’s administration didn’t want to risk a property bubble fueled by cheap money being printed by Western central banks. So it curbed enthusiasm for real estate with exorbitant stamp duties and harsh rules on home borrowers’ total debt. Prices fell almost 12% over four years. A recovery, which got underway last year, was also tamped down by the government. The good news now is that the demand-supply imbalance is easing, at least in the rental market. When Lee took up the top job in August 2004, almost 8.5% of the island-state’s housing stock was unoccupied; the vacancy rate hit a four-year low of 6.8% in September 2018. A further easing of the overhang would contribute to a rental recovery and act as an additional purchase incentive, according to Bloomberg Intelligence analysts Patrick Wong and Mohsen Crofts. I was skeptical about Singapore rents at the start of the year. Sure, they inched up 0.4% and 0.7% in the June and September quarters, from a year earlier, but they’re still 12% lower than levels five years ago. And while narrower vacancy rates should help, the bigger question is whether they alone will be enough to give landlords pricing power over rental contracts. The answer depends on immigration policy. Without new guest workers, and assuming no net addition to the half-million or so foreign-born permanent residents, Singapore’s GDP expansion will converge with annual productivity growth of around 1.5%. 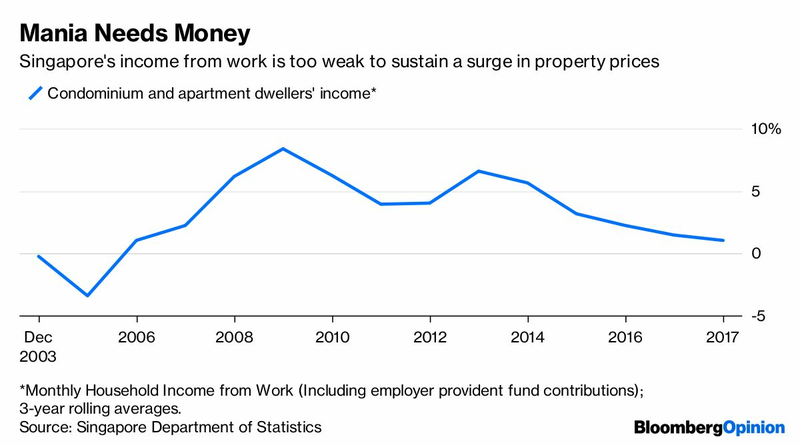 Since wages can’t possibly rise much faster, landlords might struggle to translate tightness in the housing market into higher rentals. The evidence is already there. Taking three-year rolling averages, condo-dwellers’ household income growth has crashed to 1.1%, a sixth what it was in 2012. This is when the workforce has been near full employment for years. 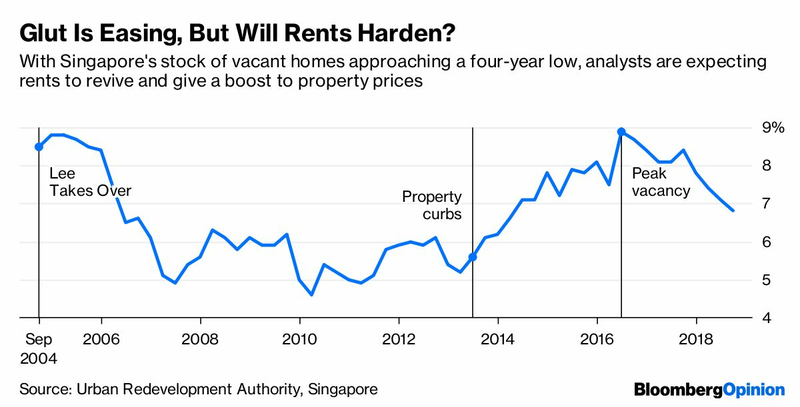 In the absence of population growth to drive demand, Singaporeans’ housing wealth can only grow if the government makes it harder for builders to offer new homes, thus tightening supply. But there’s a limit to how much developers can be squeezed with requirements such as one that forces them to raise the size of the average apartment. When a 2013 government white paper signaled a population of 6.9 million by 2030, the idea of sharing their small island with another 1.5 million people angered Singaporeans. If Heng sticks to current projections and plans to bump up the current population of 5.6 million to only 6.3 million by 2030, it would mark the second time since 1990 that the island-state failed to add 1 million people over a decade. That won’t make for a great housing market. It’s not clear if Heng wants to ask voters to reexamine the trade-off between housing wealth and immigration. But he must try. For a society with 90%-plus home ownership and strong infrastructure, accepting more foreigners is a matter of self-interest.